Looks like Intel’s Xpoint roadmap is solid and on time, by that SemiAccurate means it slipped another year. 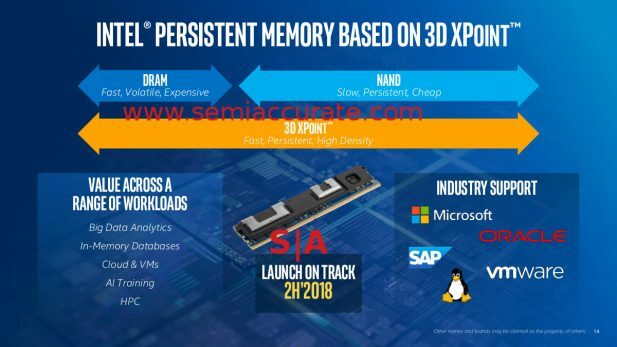 In the comedy that is Xpoint/Optane, this new ‘not a slip’ is another shining example of a tame, unquestioning, paid for press. You might recall that SemiAccurate was quite enamoured by Intel’s Xpoint memory when it was first launched. If it came anything close to what Intel promised when it hit the market about a year after the ‘launch’, it would change computing in a fundamental way. A fundamentally good way that is, it wasn’t the promised holy grail, but it would have been pretty darn good for a lot of applications. Again note the caveat of, “if it lived up to the promises”. A bit over a year later, SemiAccurate exclusively told you that Xpoint was fundamentally broken. It wouldn’t yield, it’s endurance is laughable, and it’s specs aren’t close to what is promised. Worse yet for customers, it wasn’t going to ship anywhere near the promised timelines. Sure Intel said it was ‘shipping’ at IDF but that was just to placate Wall Street and analysts. Sadly a bunch believed the hype. If you go through the article linked above, you will see that Intel promised 1000x advances in several key performance metrics and delivered 10x or less, much less. Sometimes. Endurance wasn’t up to flash at all much less better but Xpoint really does excel in random reads and writes. That said it won’t live long enough to shine in any workload that needs such granular performance, but hey, Intel takes a win when they can get it. This is why Apache Pass, aka the DIMM form factor Xpoint was, and still is MIA. In March of 2017 Intel ‘released’ Xpoint in consumer M.2 form factors and a consumer NVMe SSD. They underwhelmed. For sequential workloads they underperformed flash in many areas but for random R/W workloads they did do pretty good. Endurance was better than flash, barely. The claimed 1000x advantage wasn’t 10x, and that was achieved through massive overprovisioning, something Intel still vociferously denies. Before you pick a side on who to believe, count the chips in the P4800X and other released devices, multiply that by their density, and subtract the drive’s rated capacity from the total you just calculated. The remainder, a double-digit percentage of the total capacity, is what you call overprovisioning in a flash drive, but in an Xpoint device it is something completely different that Intel will not explain. It isn’t overprovisioning, and anyone taking Intel ad money doesn’t question this disparity for some reason. More humorous is that Intel is very proud of the Xpoint device’s endurance. How proud? Try this test, take one of the M.2 drives and run a write loop on it. When the drive reaches the rated endurance, it self-destructs. How? It drops speeds to below a USB device, that is USB not USB2 or USB3. And yes that is with the massive overprovisioning taken into account, Xpoint is SO good that Intel is afraid to let it run it’s life out like Intel does with it’s flash devices. We would love to test this on a PCIe drive like the P4800X . As we said at the end of the article we linked before, “Now it is just not going to happen for 18 months minimum if it ever materializes. Xpoint NVDIMMs do not have the endurance to last a month at the present time in testing, 3x NAND won’t last hours at the data rates of a DIMM.” We stick by our statements. That article went on to say, “In the end the results speak for themselves. Intel promised us Xpoint in early 2016 at their reveal. Now it is the ‘easy’ form factor on sale in late 2016 but it doesn’t actually work at the moment. All of this is at the vastly lowered performance targets too, from 2.5x-333x reductions on paper, nowhere close to that in ‘production’. Officially the real parts have slipped to late 2017, SemiAccurate moles are saying add a year or more if it even happens.” It is now late 2017, and the real parts aka Apache Pass Xpoint DIMMs are still MIA. We would say this is embarrassing and makes Intel look pretty silly in public but Xpoint has long passed that point and is well into “sad” territory. That said there is news, specifically at an investor conference at UBS on November 14, 2017. Better yet this news is good, no this news is GREAT! What do we mean? Take a look at this slide.